World War II was started because of aggression by various countries. In Europe Germany took over many countries with some assistance from a few other countries. Click here to see a fantastic map that shows what happened in each country during World War II. On the other side of the world, Japan was showing similar aggression as they attacked Korea, China the Philippines and numerous pacific islands. They're plan was to take control of Asia and the Pacific while Germany planned to take over Europe. Many Americans are surprised when they learned that the United States put thousands of Japanese Americans into internment camps during World War II. The government was afraid they would fight against the U.S. or help their former country in some way. As a result they put them into internment camps which were basically large prison camps. They should NOT be confused with concentration camps in Europe (concentration camps were basically death camps). The video below takes a closer look at the Japanese American internment camps. World War II, similar to World War I brought about rationing of many common items. The idea was to make sure that there was plenty of supplies for the war effort. In addition, many factories began producing only war supplies and thousands of men went off to fight in the war. These changes meant that less products could be made and farms produced less food. As a result rationing limited everything from gasoline and tires to various food products. 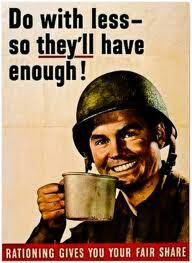 You can learn all about WWII rationing here.